​You are advised not to read this page until you have at least finished List of the Dead. The Shaeld Hratha are a newly encountered species, one which is clearly hostile to the Imperial Combine. Their point of origin is not yet known for certain, but new evidence suggests that the species may have originated in the Canis Major dwarf galaxy (→FSS). At the current time — despite several military encounters — no meaningful contact has been established with the species. Details of their governmental and hierarchical structures are subject to speculation. ​It is now believed that the Shaeld Hratha actually began their stealthy incursion into Imperial Combine territory a generation ago, an incursion which was stalled by their failure at the human colony of Parable Light (now known as the ruined world Woe Tantalum). Their current invasion of human territory appears to be a reprisal of that earlier effort. It is also believed that the Shaeld are somehow involved in the creation or control of the human sleeper agents which have come to be known as 'Rasas', and that they almost certainly have some kind of alliance with the mysterious entity referred to as Voice. The exact nature of those relationships is not yet known, but they all appear to be mediated through a shared experience referred to as the 'communion song' (→FSS). The Shaeld Hratha are thought to be risk averse, and have thus far used troops and ships stolen from their enemies as the major components of their attack strategies. There is some evidence that they occasionally visit battlefields themselves, as one may have been sighted on the surface of Guathelia by Omin Volkas and Halfre Blesson (→SFTD). 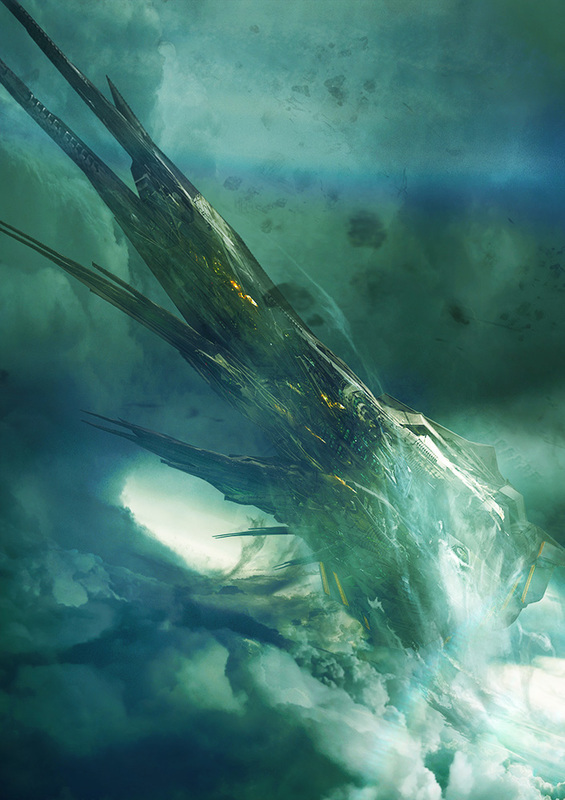 A whopping thirty kilometres long, the Shaeld dreadship is not so much a vessel as it is a mobile citadel. Every encounter between these leviathans and the Imperial Navy has resulted in human losses. ​Dreadship armaments are similar in design to those of the Imperial Combine and other major powers, although it is suspected that the Shaeld have yet to reveal their full capabilities. Dreadships carry grounding splinters and clamp drones. It is likely they also carry as-yet unseen contingency craft. Grounding splinters are two-kilometre long de-orbiting craft which are capable of ferrying personnel, cargo, or both from orbit to the surface of a planet. The deployment of grounding splinters appears to be key to the central strategy of the Shaeld Hrathan invasion, and despite military operations to investigate the splinters it is not yet clear why this should be. Grounding splinters have been dropped already across dozens of Imperial worlds, in a phenomenon now referred to by citizens as "The Falling". Only recently revealed by the Shaeld Hratha, the clamp drone appears to be a defensive contingency which is unleashed when a dreadship needs the attention of enemy craft to be diverted. Once deployed clamp drones swarm from their parent dreadships in their thousands, overwhelming the targeting capacity of an enemy's offensive and defensive systems. Each drone's objective is to clamp itself to the outer hull of an enemy craft, where it will interfere directly with power distribution and externally vulnerable systems. The Shaeld have not yet been studied extensively, but what is known is that they have a hexapod body plan, a dermis similar in texture to that of amphibians, and a truly remarkable natural camouflage ability. An adult fought by Bruiser on the surface of Guathelia was longer than he was tall, making it at least 2.52m long. It is assumed this is a typical size. During that encounter Bruiser observed that the middle set of limbs could be used either as legs, in concert with the rear pair of limbs, or as a second pair of arms. The limbs were tipped with talon-like claws (→TRD). The Shaeld are described as having "skin-webbed faces with tiny mouths and two featureless, black eyes", and a head crested by a bow-shaped feature with the appearance of an air sac. According to Imperial scientists the physical attributes of the Shaeld make them well-adapted to both climbing and burrowing. Occre Brant speculated with Elm Caden that their world of origin might have large, soft trees, into which they might burrow. Although Brant was likely joking, that would actually be one way to account for the seemingly contradictory adaptations (→TRD). The Shaeld are known to lay eggs, some of which have been captured, however one of the mysteries which currently confounds Imperial scientists is that the adults appear to have no genitalia. Nor do they appear to have organs responsible for producing gametes. Exactly how they produce fertile eggs is not yet known. Elm Caden has speculated that the transfer of genetic information may occur through the communion song, in much the same way that the Shaeld appear to share other forms of information (→FSS). The Shaeld Hratha are now believed to be telepathic, although the precise mechanism by which this is achieved remains unknown. It is apparent that the super-colonies they form could well constitute gestalt organisms (→FSS).